American BLS Reviews - 24 Reviews. Leave a Review for American BLS. This is my 22nd BLS course requirement for my Texas license and hospital affiliations and it was the best for its brevity, course content, and fair testing and should be approved by AHA. It works, it's easy and covers all you need about CPR. I am glad I did i, and would recommend anyone. Very informative. I enjoyed taking the course. Very simple to follow with the details and emphasis on procedures! The course was very interesting and educational. This program was very helpful to learn and understand how to save people ‘s life. I found the course very useful And very accommodating. I recommend American BLS to all who is seeking to gain knowledge in Blood borne Pathogens and the steps to take. Excelent, I learn a lot thanks. I have taken on site CPR classes many time, so this was a great way to renew. Easy. Thorough. Reasonably priced. Yes that's great course I learned many things thanks ! 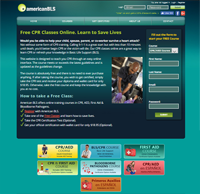 American BLS offers online training and courses in CPR, AED, First Aid and Boodborne Pathogens. All courses follow AHA guidelines and are updated frequently. Please complete your review below. Your information will help us improve our courses and help spread the word.